Want healthier, happier kids? Take them outside! Remember playing hide-and-go-seek, building a fort in the woods or catching fireflies in a jar? Many of us have wonderful memories associated with playing outside as a kid. Today, all too often, children aren’t getting enough time in nature. What will they remember when they think about their childhood? Spending time in nature is great for making memories, but did you know that it is also good for a child’s development? Research shows that kids who spend more time outside are healthier (both physically and mentally), are better problem solvers, are more creative, feel more self-reliant and have higher self-esteem. They will be the stewards of tomorrow, so lead them out of the house and help them discover why life is better outside. Not sure where to start or what to do? Here are dozens of ways to play that are easy to do at home or at a neighborhood park, or on a grander adventure to a state or national park. These activities are fun for kids but even better when the entire family is engaged. 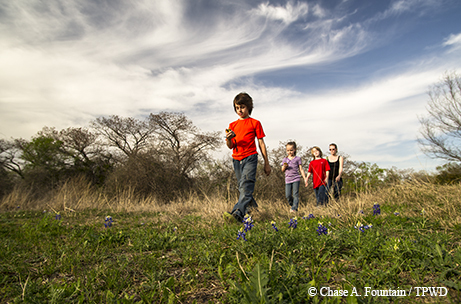 In addition to these suggestions, there are thousands of outdoor learning opportunities throughout the year at Texas state parks; find more ideas about nature activities near you at NatureRocksTexas.org. Kids are always curious about what goes bump in the night. Set aside time to get outdoors at dusk or in the evening to listen for the soft hoot of an owl, the call of a coyote or the soothing sound of the chuck-will’s-widow. Make notes about what you hear and discover what changes from month to month. All kids like to have a space that is special and just for them. Let kids find a special tree that is close to home that they can climb on, play under or just sit near to think, free from distractions. It might be fun to come up with a name for the tree or try to guess its age. Consider planting a tree, giving it a name and taking photos with it over time to see how the tree and child grow together. “The stars at night are big and bright” ... or so the song goes. Captivate your senses on a moonless night by staring at the vastness of the sky in all its starlit beauty. Find a dark space in a park or at home to marvel at the stars and learn about the constellations. Better yet, head outside during one of the year’s meteor showers to witness dozens of shooting stars. The Perseid shower peaks Aug. 12 every year, and other showers occur throughout the year. Several state parks and communities have been designated as International Dark Sky locations. Fireflies winking on and off in the soft air of a summer night have fascinated kids for generations. Did you know fireflies aren’t really flies? Catch (and release) one in a jar, and you can see it’s really a beetle. Fireflies prefer dark spaces, so turn off the yard lights and watch the show. Encourage fireflies to live in your yard by not applying pesticides, letting the lawn grow a little longer and turning off exterior lights. Unplugging from the distractions of technology is great, but it's not always an option. There are so many apps now that can help kids explore with confidence and understand the natural world they are encountering. There are apps to identify birds, locate geocaches, create maps, identify trees or name the constellations at night. Messy and creative, mud pie preparation can happen anywhere and requires little supervision. Spoons, sticks, cookie cutters and aluminum pie plates make useful tools. Seeds, pebbles, leaves and nuts from a nearby tree add interest. As they work, kids learn about the texture, absorption and drying characteristics of different soils. “I can see a dramatic difference in my kids on the days they spend outside versus a day spent inside playing video games. Their behavior, attitudes and energy levels are better. And they sleep better when they have been outside, too!” says parent Holly Thoden. Walking in nature doesn’t have to be a long, strenuous journey. For kids, a short walk with active conversation about the natural world around them is enough to grab their attention. Any walk can be turned into a nature walk when you stop to think about what you smell, hear, see or feel. Having intentional stops every 10 minutes is a great way to turn exercise time into exploration time. Outdoor cooking often involves hamburgers and hot dogs. Enjoy healthy options with seasonally fresh foods to complement the healthy choice of being in the outdoors. Engage kids in the process of cooking on a grill or over an open fire. Picnicking is a perfect way to bring generations together to make outdoor time become family time. Giving children the time and space to play is both fun and healthy. Find a place in your community where kids can run, spin around, jump up and down or come up with their own games. Make sure things are safe and let the kids’ imaginations do the rest. The joy of riding a bike never gets old. Plan to have a “Wheels Party” in the neighborhood where kids can bike, skate or ride anything with wheels. Make bike or skateboard relay teams and have races. Or plan a grander bike journey at a state or local park. Remember freeze tag? This variation of the classic game allows kids to have an outdoor game that can be played at night. The person who is “it” has the flashlight and freezes others when he or she shines the light on them. Gliding along a lake or river is a great way to experience nature and get some exercise. 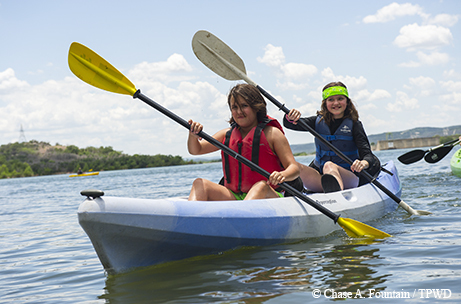 With kayaking and canoeing, kids develop a lifelong outdoor skill and gain the opportunity to see parts of nature that cannot be observed from land. Texas has designated paddling trails that meander through various eco-regions and unique parts of the state. Did you know a simple game of hide-and-go-seek can help develop problem-solving skills? Playing a game like this in the outdoors allows children to make observations, look for patterns and listen to discover where their friends and family might be hiding. 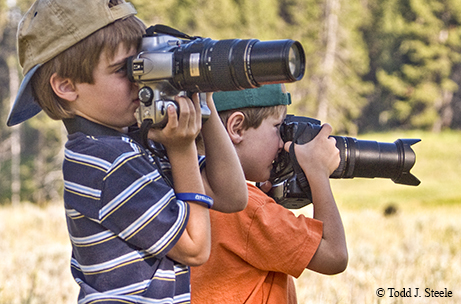 Nature presents challenges for children; let kids use their own ideas to solve them. Such challenges can also inspire cooperation — kids may try solving those problems with other kids before engaging their parents, teachers or play leaders. What shoes do we pack? How much water should we bring? Where are we going? These are all great questions to ask and answer by planning a trip. Give the kids a map or computer to decide where to go and consider how long it would take to journey there. Let them decide if their trip will involve swimming, fishing, hiking, caving or simply finding the best place to play. Work together to plan how much water, food and other gear will be needed. Planning a trip is half the fun! Adults love grand vistas and big adventures, but little ones need things on a smaller scale. Look into a puddle of water after a summer rain and you might be surprised by how much life is living in and around the puddle. Find a fallen log or old snag in the woods and see how many types of critters are using it for shelter or food or as a lookout. Consider all the life that lives below the height of your ankle as you mosey along a trail with a child. Children view the world differently than adults. Have kids show you how they see a neighborhood or local park by creating an adventure map of the area. Walk the area at least one time, then let them draw a map. They can mark places where they might stop to throw rocks into a creek, note a tree that looks fun to climb, or plot where a bird’s nest is located that they want to visit again once the eggs hatch. Children love to have a space that they have created and they can call their own. Building a fort in the woods or in a yard is something fun for many ages. 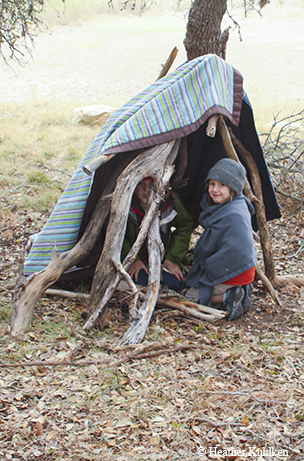 Children can make a lean-to with sticks and branches, string a tarp between trees or build something more elaborate with lumber and nails. Whichever method they choose, the important thing to remember is to let the kids use their imagination and sense of cooperation to build their special place. Sleeping in a tent, building a campfire and listening to the soft sounds of night are all part of the pleasure of camping. Texas has thousands of campgrounds both public and private, but sometimes starting slow with a backyard campout can be the ticket to introducing kids to the outdoors. Setting up a campsite takes teamwork — the entire family can pitch in. “I can see my boys’ imaginations come to life outside; critical thinking and observation skills are nurtured, and creativity and independence are born,” says parent Jenny Sander. Making a boat doesn’t have to be elaborate. Find some scraps of lumber, an old T-shirt for a sail, a few sticks for a mast, some string and a few nails. Use one piece of wood for the hull of the boat, place a wood block in the center, nail it down, tie or nail the stick to the block, make a cross with the sticks to form the mast and attach the sail. Tie the string to the end of it for a tether. Take the boats to a creek, pond or lake to have boat races or just play. You don’t have to be on the beach to build a sand castle. All you need is fine sand, water and your imagination. Sand sculpting can be a family project, with tasks appropriate to every age level. Bring shovels, spoons or cups for digging, buckets for mixing, and sticks, shells or rocks for decorating. Don’t have a sandbox? Just lay down a piece of tarp to dump the sand onto and use rocks or lumber for the sides. Videos can be a fun way to capture and share an outdoor adventure. Be spontaneous and edit together what happened that day. Or go bigger by writing a script, drawing storyboards and using nature as the backdrop for the story. Let your imagination run free. Editing is easy with iMovie and other video editing software. So many of the poems and stories that have stood the test of time were inspired by nature. Having a child or group of children write about what they are seeing, hearing or feeling while on a nature adventure is a good way to slow down and reflect. Find interesting subjects in nature and write simple haikus or longer, theme-based poems. From Walt Disney to Monet, artists near and far have looked to nature to inspire them. Art can be a watercolor painting or a simple arrangement of rocks, sticks and leaves. Another creative art project is to let kids photograph what they see in nature — make a collage from the images or put them into a journal. Older kids might consider making a short video. You can also create something useful like a birdhouse and give it an artful flair by letting the young ones paint it and apply sticks, feathers, string or other decorations for a one-of-a-kind project. When children build a relationship with nature, they tend to be more inclined to care about their natural world as adults. Learning about food webs, water systems, weather and migration patterns of wildlife all help kids understand the relationship between themselves and the world around them. Texas has some of the best birding in the world. 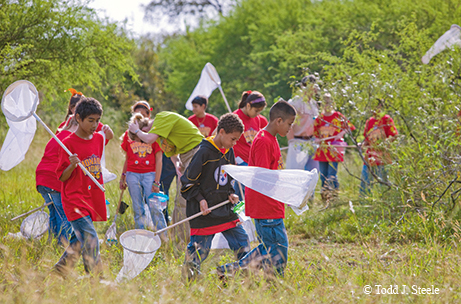 It is a great way for kids to observe wildlife, learn about migration and habitats and even become citizen scientists when they log their observations into Texas Nature Trackers or eBird. Setting out a feeder or birdbath will attract birds to a fixed location that makes it easier for families to see the variety of birds in their community. Volunteering is a perfect way for kids to experience outdoor programs such as planting trees, cleaning up a park, caring for wildlife and learning lifelong lessons about giving back. Older youth can contribute through community service projects such as planting wildscapes at school campuses or removing invasive plants at a local park. Volunteer projects are also a great place for families to meet other like-minded kids and adults. Have you ever watched children’s eyes light up when they see a wild animal? The more children know about wildlife, the more apt they are to care for it as they grow up. Seeing a wild animal during the day is exciting, but seeing an animal at night can be thrilling. Kids can see nocturnal animals while camping or taking a family walk in the moonlight. Consider putting up a wildlife camera in a safe location and see what passes by in the night. A shallow creek or beach can entertain a child for hours. Splashing around, making dams, throwing rocks or having stick races are activities that can help pass the long, hot summer days. Adults are encouraged to get their feet wet as well. Each connection, large and small, builds the relationship between child and nature. Butterflies like the monarch need our help to survive. 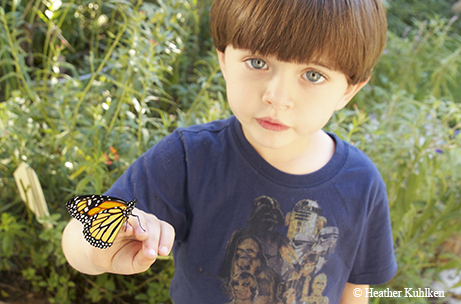 Kids can help by planting a butterfly garden at their school, at a public park or even at home. Even just a few native plants can attract butterflies and give kids the opportunity to see them up close and know they have helped provide food for them. Finding tracks in soft soil or mud is like finding a clue. Tracks can tell us who else might use the trail, enjoy a drink at the creek or pass through the campground at night. Have the kids compare the tracks to their own hands or feet to get a sense of what size the animal or bird might be. Follow the tracks to see where they lead. Have kids guess what creature might have made them, then look up the tracks in a book or online to verify if they guessed correctly. Who says there isn’t hidden treasure out there? Geocaching brings together technology and the great outdoors in a hunt for hidden treasure. There are geocaches in almost every neighborhood or local and state parks. Fire up the GPS or just use your smartphone and plug into nature by using technology. Campfires light up the night, provide warmth and offer a special space to share stories. Some fire builders prefer the pyramid method, while others make a log cabin with the wood. Either way, kids can contribute to building the fire or being the special “fire lighter.” The flicker of the flame will entertain kids of all ages well into the night. Always check for burn-ban restrictions during hot, dry conditions. Don't forget the marshmallows. Texas has a long tradition of hunting game such as white-tailed deer, turkey or quail. Kids who learn to hunt safely and with positive ethics can engage in an outdoor pursuit that can last a lifetime. Hunting teaches patience and respect for the animal being harvested. It’s a skill that gives adolescents the confidence to provide for themselves. Hunting also requires kids to have self-discipline and focus, which are important developmental functions for teens. Be sure to enroll them in a hunting education course. Catch and release or catch to eat. When children learn to fish they have a lifelong skill that provides them with enjoyment and a food source. When taking a kid to fish for the first time, consider going somewhere that has been freshly stocked or has plenty of fish. Reeling in a fish on the first outing is a surefire way to hook a child for life on the simple pleasure of fishing.